Baroness Brady CBE began her career at LBC when she was 18 years old and swiftly moved onto Saatchi & Saatchi as junior Account Handler. She joined Sports Newspapers Ltd in 1988 and became Director within a year. Karren is now known as the first woman in football. She was Managing Director of Birmingham City Football Club from 1993 to 2009 and during that time turned the Club’s fortunes around. She took over Birmingham City FC when it was in administration, and in her first year at the helm, the Club recorded a financial trading profit. In 1996 the Club made an overall profit for the first time in modern history and in February 1997 the Club launched on the Stock market valued at the time of float at £25,000,000; she was the youngest Managing Director of a PLC in the UK. During her tenure at Birmingham City Karren increased the average gate of the Club from 6,000 to a sell out capacity of over 30,000 and in 2009 her business was valued at over £80million. In January 2010, Karren was appointed Vice Chairman of West Ham United FC. Karren has attracted much media attention in her position, and was the subject of an hour long documentary ‘Inside Story’ - The Real Life Manageress’ shown on BBC 1. She has hosted her own TV show, Brady Bunch, and has also presented both Loose Women and Live Talk on ITV and she has also presented Central Weekend Live. She is regularly featured in the news, on TV and radio. Karren has written four books; a factual account of her first season at Birmingham City, ‘Brady plays the Blues’ two novels, ‘United’ and ‘Trophy Wives’ and her latest book ‘Playing to Win’ is about successful women in business. Karren is a columnist for The Sun newspaper; the UK’s biggest selling national daily newspaper. She is a judge of the Cosmopolitan Women of Achievement Awards and the Sports Industry Awards. She is on the business Board of Scope, and the Ambassador for Birmingham Women’s Aid. She has been a Board Director of Mothercare PLC, Channel 4 Television and Sport England and is currently a non-Executive Director of Arcadia. She is an honoree Fellow of the Institute of Sales and Marketing. She was voted by Cosmopolitan as one of the 100 most powerful women in the world and in 2004 and in 2006, attended The Queen’s lunch for Women Achievers and Business Leaders. She was acknowledged as one of the most influential women in Britain by the Daily Mail and voted as one of Britain’s Most Inspirational Women by Good Housekeeping magazine. In November 2006 she won the Cosmopolitan Woman of the Year, in the category of Women Who Have Changed the World. In December 2007 Karren was a guest on Desert Island Discs and February 2008 saw the launch of Karren Brady’s ‘Today’s Business Woman’ magazine. In October 2007 Karren was voted Business Woman of the Year and in November 2008 she was named as one of the top leadership role models in a national poll. This recognition was quickly followed in December 2008 when she was presented with the coveted Spirit of Everywoman Award at the NatWest Everywoman Awards, acknowledging her outstanding achievements in changing the landscape for women in business. During January 2009, Karren presented a series of features for ITV1's GMTV called Just the Job, helping people back into work, and giving advice about looking for and retaining your job in this uncertain economic climate. 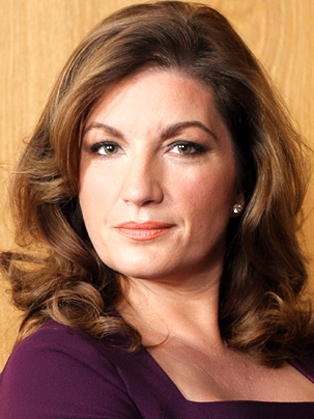 November 2010 saw Karren listed in the business category of The Sunday Telegraph’s ‘100 Most Powerful Women in Britain’, whilst she was also included in the Evening Standard’s list of ‘London's 1000 Most Influential People 2010’. Now, following appearances as one of Lord Sugar’s interrogators on the popular BBC show ‘The Apprentice’, Karren has replaced Margaret Mountford as Lord Sugar’s right-hand woman in Series 6 alongside Nick Hewer who retired from in legendary Apprentice post in 2014. Karren is one of the most sought after speakers in the world and has worked in over 30 countries, motivating and advising global businesses through her award-winning speeches.